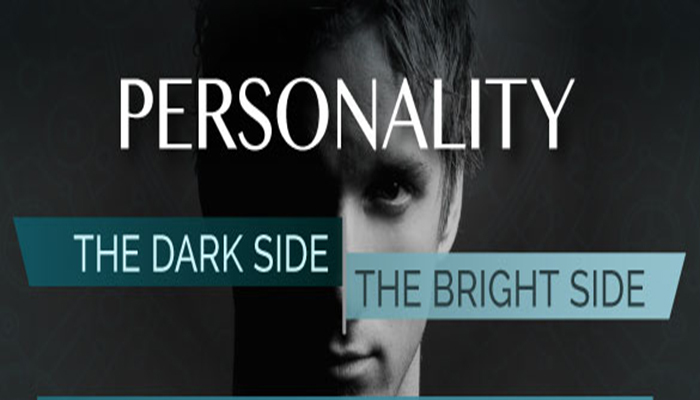 In my LinkedIn article, The Dark Triad, I explained that personality is expressed in terms of bright and dark traits, where bright traits are typically associated with positive, pro-social behaviours and dark traits are associated with negative, anti-social behaviours. Since personality traits express themselves in terms of specific behavioural characteristics, understanding an individual’s trait makeup (and your own) allows assumptions to be made about their typical behavioural tendencies and improved self-awareness. Consequently, personality traits play an important role in predicting major life outcomes, such as: educational achievement, job performance, economic success and the wider ability to develop successful and enduring social relationships. Rather than being static, as was originally thought, personality is fluid, it interacts with a very wide range of environmental/situational factors and it is modified through experience and learning. This is because while around 40% to 50% of our personality is genetically heritable from our parents, the remainder is learned, by experience and from the role models around us. All personality traits present themselves on a broad spectrum. At their extremes, traits may manifest as some form of (observable) maladaptive behaviour. In the case of the Dark Triad traits (narcissism, Machiavellianism and psychopathy), the extremes of these traits are identified clinically as personality disorders. Consequently, much of what is currently known about these dark traits originates from the study of the relatively small clinical populations, reported to be about 1% of the general population. More recently it’s been discovered that dark traits also exist on a spectrum in the sub-clinical (normal) population. The Corporate Psychopath is an example. However, this realisation comes with an ethical dilemma because the clinical origin of these dark personality traits can lead to misunderstandings that unfairly stigmatise individuals and result in unjustified discrimination. That’s a problem. Although narcissism and psychopathy share a label and are the same species at both the clinical and sub-clinical levels, they are as similar as lions and domestic cats. We should therefore be cautious about mislabelling people and about what we conclude from articles referring to ‘Toxic Workplace Behaviours’. Undesirable behaviours are not all related to personality, neither are clinical disorders and sub-clinical personality traits the same. Although the study of dark personality isn’t new (Kraepelin and Diefendorf reported on in 1907), its development has been muted in wider society. However, it is now becoming a very ‘hot topic’ as there have been recent reports of a dramatic increase in the prevalence and strength of all of the dark triad traits compared with twenty-five years ago. This is said to be because western society is more competitive and materialistic than it was in the past and the behaviours associated with these dark traits are required in order to be successful. As a result, we have become more psychopathic, more narcissistic and more Machiavellian, because today’s competitive environment requires it and the smart phone in our pockets enables it. The Dark Triad is represented by the three traits:Narcissism, Machiavellianism and Psychopathy. These tend to lead to individuals derailing in their normal everyday lives (personal and professional) and, even with high functioning individuals, they are mostly likely to become evident during periods of stress when the individual lacks the cognitive resources to control their impulses, or is otherwise conform with social norms and expected social behaviours. NOTE – If you are interested in seeing how you might score on the sub-clinical version of the Dark Personality scale, just follow this link to an open-source short form version (based on Paulus, 2011) but please note the caveats on the web page. Most individuals (and organisations) possess some level of narcissism that colours their perceptions and determines their behaviours. At the sub-clinical level, high trait narcissists (high narcs) are described as being: proud, arrogant, cocky, highly self-centred, controlling, duplicitous, and hyper sensitive to criticism; they have a high sense of entitlement, seek status and prestige, they feel superior to others and have an inflated view of themselves. High narcs lack empathy and are exhibitionist, exploitative and have dominant personalities. They are boastful and prone to exaggerating their achievements; they block feedback, refuse compromise and tend only to pursue relationships with individuals that provide them with the admiration they crave, consequently narcissists tend to engage in a lot of short term relationships. Since high narcs are primarily concerned with displaying and acknowledging their own brilliance, they desire praise, admiration and recognition to the exclusion of everyone else. The self-aggrandising ego trip is a trademark of the narcissist. They lack human values, fantasise about control, unlimited and unrealistic levels of success and admiration. Being self-serving, narcissists make decisions based purely on self-interest rather than in the interests of colleagues or other important stakeholder relationships. High narcs are also associated with aggressive behaviour and they will typically either ignore negative feedback or respond to it aggressively. However, if egos are threatened, or if they are publicly censured or criticised, they are likely to fly into a rage as they lack impulse control. is the name of a ruthless and selfish approach to management originally advocated by Niccolo Machiavelli. The trait of Machiavellianism was explained by Christie and Geis who developed a personality scale based on Machiavelli’s ideas. Of the three dark traits, Machiavellianism is the only trait that is not also considered to be a clinical disorder, even in its extreme. The high trait form of Machiavellianism is referred to as high mach. High machs are outwardly critical, they endorse a negative view of others and they are more likely to make ethically suspect choices. They consider themselves skilful manipulators but if they lack emotional intelligence, their manipulation skills will not match their self-image. High machs are observant and very aware of their surroundings. They are cunning, calculative, intelligent and tend to be relatively successful in their careers, particularly if they work in unstructured and/or less organised settings – such as environments undergoing cycles of transformative change. However, as organisational structure increases their personal success tends to decrease. High narcs are not necessarily disliked by others but neither are they exceptionally successful at politicking [because their motives are transparent which corrodes trust]. While high machs are more likely to cheat, lie and betray others if it gives them an advantage, they also tend to avoid regular or extreme forms of anti-social behaviour. Overall, narcissism is described as a strategy involving social manipulation for personal gain but, unlike psychopaths, high machs are not devoid of conscience. However, they are similar to psychopaths in that they pursue strategies that promote self-interest, use deception, flattery and emotional detachment to manipulate and exploit relationships to their own benefit. Like narcissism, psychopathy was originally considered a clinical disorder (antisocial personality disorder), but it too has been recognised to exist on the sub-clinical spectrum. At a sub-clinical level, high trait psychopathy is characterised by a lack of empathy and concern for other people, social regulatory mechanisms and social norms. Psychopaths are generally ill tempered, highly impulsive and completely devoid of conscience, guilt, or remorse when their behaviours are harmful to others. Interpersonally, high psychs are skilled impression managers who are slick, charismatic and superficially charming. Emotionally superficial, they tend to adopt parasitic lifestyles and will engage in criminal behaviour if it achieves their ends. High psychs employ high levels of deception, manipulation and are described as being crafty. However, they also have an inflated view of their abilities and this creates the likelihood that their true nature will be noticed. Not all psychopaths are criminals. Misinformation and confusion in the media have created a misconception of the clinical form of psychopathy in the general public. This is more apparent still with business professionals who see even less relevance of psychopathy to their daily interactions with colleagues in the workplace. Even so, psychologists have recognised that some psychopaths have good impulse control. They are not prone to outbursts of spontaneous, violent, criminal behaviour and they function successfully and exist in society relatively undetected unless stress or other situational factors make their destructive trait . Such individuals have more recently been referred to as Corporate Psychopaths and they are thought to have certain behavioural advantages over individuals that score lower on the psychopathic scale. Corporate psychopaths are reportedly the product of the modern corporation where the rate of change, high turnover of staff and limited selection processes ignore their negative traits and allow them to advance to the most senior positions. Despite the associated stigma, dark triad traits are not necessarily bad, or undesirable. Dark traits also have a bright side, in fact, some of the most successful individuals on the planet would score highly on the dark triad scales and they owe their successes (and high profile failures) to their personality. Because of this, we shouldn’t simply consider dark traits negatively, despite the fact that high expressions of any of these traits can be destructive and have consequences well beyond the actions of an individual. Although narcissistic individuals may develop poor relationships in the long term due to negative perceptions of their behaviour being developed over time, narcissists are not necessarily unproductive and there is evidence that they may actually excel in positions of authority. For example, studies have found that narcissism was positively associated with leader development. This is in stark contrast to the other two dark traits which negatively predict leader development. Narcissistic leaders can be charismatic and have the kind of personalities that inspire followers. Narcissistic CEOs influence organisational performance as these CEOs take big, bold, attention grabbing actions that have significant consequences – positive or negative. Consequently, organisations led by narcissistic CEOs tend to experience more variable performance compared to organisations whose CEOs are less narcissistic. The narcissist’s high degree of self-confidence, extravert nature, talkativeness and drive for self-promotion tends to increase their employability and they have been found to be effective at creating positive first impressions in job interviews. This later extends into self-promoting their way into leadership positions. Unfortunately, those positive impressions wear off with prolonged exposure to the narcissistic individual as their antisocial, noxious, behaviours become apparent to others. In positions of authority, high narcs may belittle subordinates and exploit insecurities in order to create dependencies. Unlike psychopaths, high narcs have a conscience and they are acutely aware of the negative impact of their behaviours so they try to change their personality in order to be liked and admired. Many of the qualities associated with Machiavellianism are consistent with the needs of leadership roles and roles requiring extensive negotiation at their core. For example, high machs have skills in people management, they have organisational and political savvy, emotional detachment and decision making acumen based on objective criteria rather than trust, loyalty, and emotions. There is a positive association between Machiavellian leaders and leader effectiveness as high machs are associated are generally excellent at forming political alliances, impression management and being social chameleons by adopting the attitudes and behaviours of those around them. This allows them to develop strong social networks, gain respect and trust from colleagues while achieving desired outcomes with clients – all of which contribute positively to performance. Within Government institutions, high machs have been reported to serve longer terms in elected office and record a greater number of achievements, particularly when the trait is paired with high intelligence. While organisational citizenship behaviour is primarily motivated by altruism (and high machs are anything but altruistic), they may display these behaviours if it curries favour and portrays them in a positive light. In fact, paired with a high degree of social effectiveness, high machs may be able to mask the more destructive behaviours associated with this trait. However, in the long term the trait is self-defeating and any positive aspects are counter-balanced by the outcomes of negative behaviours as time goes by. Therefore, if an individual relies on manipulation but lacks the self-presentation skills needed to support it, the manipulation will be recognised and the trust underpinning the relationship is diminished or destroyed over time. This reflects the general research finding that high machs typically engage in negative workplace behaviours and are less productive – regardless of the level of their authority or the degree of collectivism in the organisation. Psychopathic individuals in leadership positions tend to result in diminished corporate social responsibility and support for employees, leadership failure (or derailment). In turn, this affects the attitudes of employees, functioning of teams and organisational performance. However, in some cases, the characteristics of psychopathic individuals may be entirely complimentary to the mission, vision and goals of their organisation and there is anecdotal evidence to suggest that at least one major UK bank is positively screening for trait psychopathy. This is particularly the case where the work requires a rational, emotionless, dispassionate style in an individual who is willing to take risks, has sufficient social skills to be charismatic, can handle people, has political and organisational savvy, has sufficient detachment to make decisions purely on the basis of objective criteria and isn’t swayed by the need to maintain trust, show loyalty, or express emotions. In such cases, the intense focus on goal achievement may be acceptable to the organisation, even if it comes at a cost to others. NOTE – If you are interested in seeing how you might score on the individual dark triad scales you can follow the links provided below but please note that they are offered purely to help raise awareness. The sub-clinical versions of these scales are not clinically appropriate. It may be idealistic to think that individuals and the organisations in which they work, will be able to manage the vast complexity associated with their dynamically interdependent personalities but, the continuing development of: research methods, inferential statistical techniques, Big Data, Predictive Analytics, Cognitive Bias Modification; technologies like facial recognition, apps, ‘wearable tech’ and the field of epigenetics will, in time, help to bridge the knowledge gap and address some of the challenges in assessing these traits. In the mean time, sharing what we know to improve understanding of personality provides opportunities for increased self-management and self-awareness. I can’t imagine any circumstance where this isn’t a good thing, whether it’s in your personal life, or in a professional context. If you would like to read more on the subjects of personality and virtual teams please Follow Me on Linkedin. Trust is a Fallacy, get over it!